This page contains a character guide for Black Canary in Injustice 2. Here you’ll find movelists, combos, juggles and strategy guides and recommended gear. For more Injustice 2 content, head over to our Injustice 2 top page. Dinah Laurel Lance was born into a family of crime fighters. Born with a unique metagene that grants her sonic powers, the younger Dinah chose to become a crime-fighter at the age of nineteen, despite her mother’s wishes to the contrary. Following a rigorous training program under the watchful eye of Ted Grant, Dinah took up her mother’s identity and adopted her costume as her own. Since then, Dinah has served both the Justice League and the Birds of Prey. She also struck up a romantic relationship with Green Arrow. Meter Burn R2 (must press R2 at the beginning of High Parry). Sonic Scream can be performed while in the Air. Canary Cry has 3 levels, each level makes the attack more powerful. Holding ○ will charge Black Canary’s scream meter faster. Below are combo and juggle inputs for Black Canary, including corner strategies and restarts. In story mode and in the Injustice Gods Among Us IOS game, interestingly, Black Canary is depicted wearing a domino mask. While this incarnation of Canary is understood to be Dinah Lance, the domino mask is often attributed with Dinah Drake, the first Black Canary. Drake wore a domino mask during her first few adventures in the “Golden Age” of comics before the mask was jettisoned after several issues. However, Batgirl’s IOS Support Card, “Birds of Prey”, depicts Black Canary without the domino mask. This look is based off of Black Canary’s current New 52 appearance. 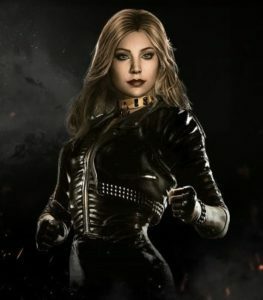 Like John Stewart, concept art was created for Black Canary, suggesting that she may have been at one point considered to be a part of the original 24-character roster for Injustice.